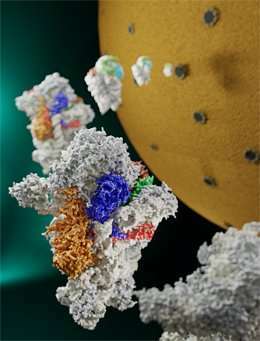 Ribosomes are the cell's protein factories. Researchers from Ludwig-Maximilians-Universitaet (LMU) in Munich have now structurally characterized late stages in the assembly of the human small ribosomal subunit, yielding detailed insights into their maturation principles. Proteins provide the crucial structural elements of all cells and mediate the executive functions required for cell survival. In most cell types, specific sets of proteins must be produced constantly and in widely different amounts. In order to carry out this vital task, the cell must ensure that it has enough of the complexes required for the synthesis of proteins—the ribosomes. Eukaryotic (i.e. nucleated) cells can produce ribosomes in enormous numbers, although each consists of about 80 proteins and 4 ribosomal RNAs (rRNAs). Moreover, some 200 other proteins known as biogenesis factors are necessary to ensure that the assembly process takes place without a hitch, and that all components of the functional ribosome find their proper places in its complex architecture. Researchers at LMU's Gene Center, led by Professor Roland Beckmann, have now determined, at high resolution, the three-dimensional structure of several assembly intermediates that are formed during the later stages of ribosome formation in human cells. Their data reveals in detail how the ribosomal RNAs are progressively folded to provide the necessary binding sites for the cognate ribosomal proteins. The findings are reported in the latest issue of the leading journal Nature. Ribosomes are made up of two subunits, small and the large, which are assembled separately and interact to form a single functional unit only when needed. Production of both subunits begins at the site of synthesis of the rRNAs in the cell nucleus. The rRNAs are transcribed as larger precursors, which serve as a scaffold during the assembly process and are cleaved and trimmed during ribosome maturation. After the initial steps in assembly, the immature subunits are transported from the nucleus into the cytoplasm. In eukaryotes, the mature small subunit contains one rRNA and about 30 proteins, while the large subunit is made up of three rRNAs and approximately 50 proteins. "Everything we know about the assembly of eukaryotic ribosomes derives from studies on simple organisms such as baker's yeast," says Michael Ameismeier, a Ph.D. student in Beckmann's group and, together with Jingdong Cheng, joint first author of the new paper. "We have used cryo-electron microscopy to determine the structures of intermediate forms of the small ribosomal subunit isolated from human cells." The structures that have now come to light provide insights into a highly complex process. "In fact, we were able to characterize not just one precursor but to visualize the structures of five states of assembly. We were then able to order these structures into a chronological sequence, and analyze how they differ from one another," Ameismeier explains. The earliest structure in the sequence still originates from the cell nucleus. The other four are successively formed following export of the first precursor to the cytoplasm. The succession of precursors reveals that maturation of the small ribosomal subunit proceeds in several defined steps. "The assembly sequence is controlled by biogenesis factors, such as RRP12 and PNO1." And the whole operation is completed when NOB1, an endoribonuclease enzyme, cuts the rRNA at a specific site. The mature small subunit can then bind to the large subunit, in association with a messenger RNA that provides the blueprint for protein synthesis.